Rare images of the effects of bombing attacks on Wearside during World War II have gone on display in Sunderland. The exhibition, called Bombed Out, is part of a series of events to mark the 60th anniversary of the end of the war. 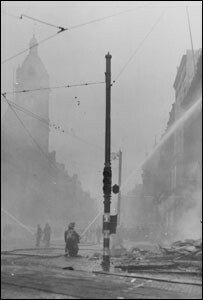 It includes official photographic records of bomb damage in the city, which are being displayed alongside contemporary views of the same sites. The exhibition, at Monkwearmouth Station Museum, will be open to the public until August. Martin Routledge, assistant keeper of social history at the museum said: "People's lives were affected in many ways during World War Two. "Mostly it was having to deal with loved ones being away from home or dealing with shortages. The war changed people's lives and the face of Wearside forever." Sunderland was one of the most heavily bombed towns in the country during World War II. There were 35 raids when bombs were dropped. Some 267 people, including 28 serving officers of the Civil Defence, were killed. Another 362 were seriously injured and a further 629 slightly hurt. More than 1,000 houses were destroyed and 2,700 badly damaged.